For the working hands! 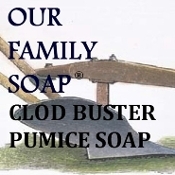 Our clasic soap with the addition of ground pumice and spruce tree eo. Great grime removal and protection for your skin at the same time. 4oz bar.